The much-anticipated Tesla Model S, which started production last week, uses a lot of aluminum, and that has industry groups pleased as punch. Alcoa and the Aluminum Association released laudatory statements abut the Tesla Model S, a full-sized and electric-powered sedan. "Tesla's Model S is an example of the next frontier in what automakers are achieving with aluminum," said Randall Scheps, chairman of the Aluminum Association's Aluminum Transportation Group in a news release. "Tesla is among the leaders driving automotive aluminum use, which will double within a decade yielding more mass produced, high volume aluminum-intensive vehicles that will hit showrooms." Alcoa, the world’s largest miner of bauxite and refiner of alumina, also "saluted" the new car. Vehicles are typically made from a variety of materials like copper, magnesium and plastics. Steel is still the largest component, making up 60% of a vehicles average weight, according to the USGS. The amount of steel used in cars has been dropping due to material substitution and a drive toward making lighter, fuel efficient cars . In 2001 automobile manufacturing consumed just 5.3% of the America's steel stock. 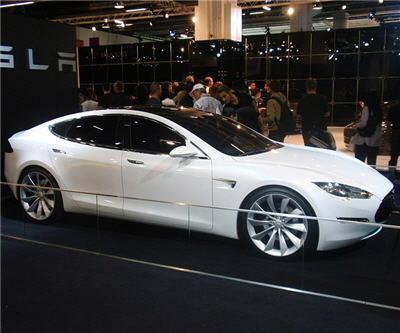 A Tesla Model S, which starts at a base price of US$57,400 and has a range of 426km, is made from a lot of aluminum. "Your Model S actually starts as a huge aluminum coil that weighs up to 20,000 pounds wrote George Blankenship, Vice President, Worldwide Sales and Ownership Experience. "This coil is unfurled and fed into our Blanking Line that cuts the aluminum into large rectangles aptly called 'blanks.'" The Model S is made from different materials than Tesla's first car. "For limited or low-volume production cars like the Roadster, carbon fiber is a great material to reduce weight," said Tesla Design Director Franz von Holzhausen on the car company's blog post. "It's not a solution for higher-volume production due to cost and manufacturing time. For Model S, we are using aluminum for the body panels and chassis. Aluminum is as strong as steel but lighter in weight, and has similar manufacturing capabilities. Lighter weight translates directly to efficiency." So far reviews of the car are good. USA Today calls the car "spectacular".